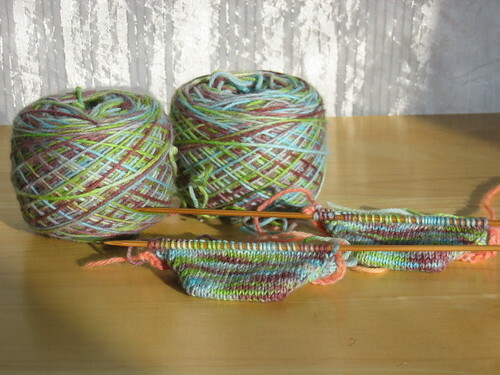 I decided to start the new year by knitting a new pattern - Anastasia socks. This is obviously only the beginning, I haven't even gotten to the eyelet part of the pattern yet. I'm very happy with how the yarn is knitting up so far, but I'm afraid that there may be some pooling once I get past the toes. I modified the pattern a tiny bit. The pattern called for a 2.25mm needle with 60 stitches, I'm using a 2.75mm needle with 64 stitches. I *think* this will fit me, unless the eyelets add a gigantic amount of stretch to the finished sock... the ugly anklet socks I knit were 68 stitches on a 2.75mm needle and they fit perfectly.